Labour have victory over SNP in the Glenrothes by-election. Lindsay Roy won with a majority of 6 737 over competitor SNP’s Peter Grant. The new MP has now left his job as rector of Kirkcaldy High School. The election resulted with Lib Dems in 3rd with 947 votes, and Tories in 4th with 1381 votes. 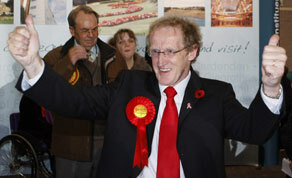 Former Labour MP John MacDougall died in August after being diagnosed with asbestos related cancer mesothelioma. Mr Roy will now take his place. Mr Roy met Prime Minister Gordon Brown for breakfast before taking his seat in the House of Commons. He was given a welcoming cheer before entering. The 59-year-old was Mr Brown’s head teacher at his former high school. He is also a father of three and has a passion for football and mountain biking. Deputy First Minister Nicola Sturgeon described the result as being “very disappointing” for SNP. She also accused Labour’s campaign of being “negative” and focused on the one issue. Posted in Politics and tagged By-election, Glenrothes, Labour, Lindsay Roy. Bookmark the permalink. Private schools creaming off state pupils?